I downloaded Office 2007 Beta 2 from MSDN and testitto see if I could use it for my day-to-day needs... I did not really use everything but Word, Excel & Outlook. I installed on top of my Office 2003 and installation was without a hitch. I liked the new interface in on all of the Office products I tested. I think MS did a very good job! What else I liked? RSS support! It worked very well. I was able to import my OPML file of feeds and in a few seconds all of them were downloaded to Outlook. It also gave me an option to download the complete feed as a html attachment. Search was considerably faster compared to Office 2003, however, it asked me to download MS Search companion which did not install on Windows 2003 Server. In the newest Windows Live Local release, users will be able to see how heavy or light traffic is along specific U.S. roads, find out if and where there are accidents, and how serious they are. For this new feature, Microsoft is partnering with Traffic.com. Also new is a functionality Microsoft calls "collections," which lets users save their favorite places and locations to an online notebook, upload photos and add notes. Users will also be able to share with others these scratchpads’ content via e-mail or the MSN Spaces blogging service, creating a sort of social network based on Windows Live Local. 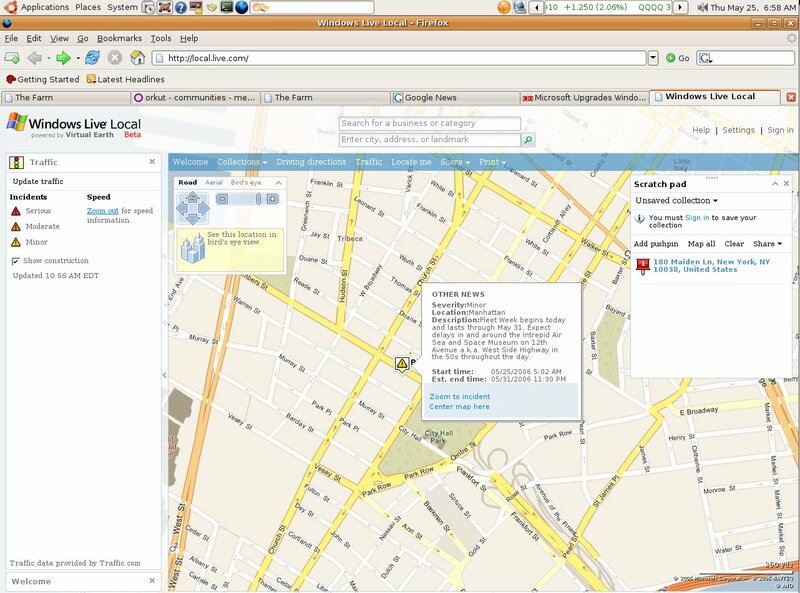 This new version also features integration with the Windows Live Messenger instant messaging service, so that users can initiate an instant-messaging session from within Windows Live Local while seeing and interacting with the same map. 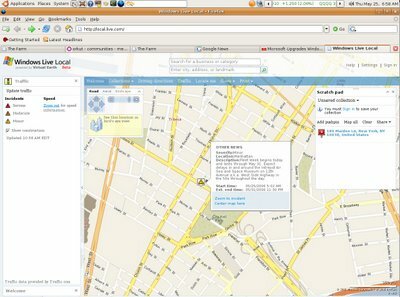 In addition, Microsoft is releasing a new plug-in for Windows Live Local that extends the service’s mapping functions to the company’s Outlook e-mail, calendaring and contacts application. 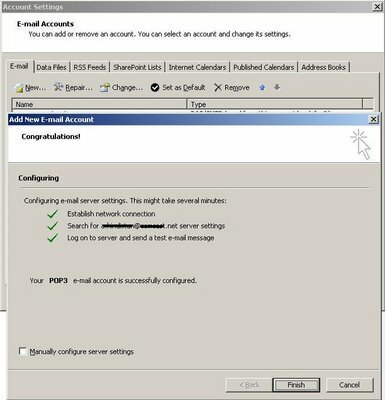 With the plug-in, Outlook XP and Outlook 2003 users will be able to find and print Windows Live Local maps from within Outlook. The plug-in will be available as a free download. Read the rest of the story here. Just wanted to blog a very nice tips & tricks page for Ubuntu which is part of Ubuntu FAQ. How does Yahoo, MSN stack up against Google? According to the latest numbers compiled by Hitwise Blogger Bill Tancer, Google is the search-king (no surprises there) but Yahoo leaves Google in dust when it comes to e-mail, news, finance etc. Nice compariso tables over there, check it out! I was not sure if it would work, but it did. I was able to relatively easily install DVD Decrypter 3.5.4 via wine & rip a DVD! (I did NOT need to run winesetuptk, it did not work for me anyway). When I first launched DVD decrypter, it did not detect any drives but then when I popped in a DVD, it was able to detect both y: and z: drives and I was able to rip the dvd. Sweet! Today, I was trying to figure out how I can run DVD Shrink on my Ubuntu. At some point, a DVD was stuck in my DVD-ROM drive and eject button would not work. with a lock on this directory cannot access it anymore and therefore it can be successfully unmounted. I love BBC's tests and I mentioned some of them here. The latest one I discovered is about testing your senses: 8/20 (I think I was too tired to take this test so late at night). The shellcode contained in the MS Word document decrypts and drops the backdoor's file as csrse.exe in the Windows temporary folder. After execution, this file then drops a second file, winguis.dll to the Windows System folder. The dropper then deletes itself from a system. The .dll file acts as a main backdoor component. This file also exhibits rootkit functionality since it hides certain processes from the computer user. Look for the Windows registry key(s) created by Ginwui.A. Recovery: Remove all files and the Windows registry key modifications associated with this malicious code threat. Restore corrupted or damaged files with clean back-up copies. Restore script.ini and other files potentially overwritten by the Trojan. Validate the functionality of all anti-virus and security-related software. And finally, Last year, I was sent to Tokyo for a business trip. Having lived in Japan for many years, my manager (then) called me into his office and made me a list of places to see. On top of the list was famous Akihabara, the electronics town! So, if you would like to know about newest, coolest gadgets, here is a site for you: www.akihabaranews.com. It's available in its beta form here http://www.microsoft.com/windows/windowsmedia/player/11/default.aspx but honestly I don't know what's the big fuss about. It's polished and surely looks better than previous versions but I have not really noticed a huge difference. Maybe I have not looked around too carefully? There used to be a lot of good & free websites, that offered favorites/bookmarks syncronization. My all-time favorite was SyncIt. Then, they started charging for the service and I dropped them! (Hmm, I just checked and it looks like they are free again). Now that we have google, it's usually faster to find something by searching instead of trying to locate it among your bookmarks. Still, we can't stop bookmarking, can we? So, in a catch-up game with Google, Microsoft started to offer some internet goodies, one of which is called "Windows Live Favorites". It's free in its beta form. You can easily upload all your bookmarks and access/edit them online anywhere. There are also some other not-so-bad utilities on microsoft's ideas.live.com web site that you may want to check out. PowerFolder is a free peer to peer tool that synchronizes whole folders over the internet or local network. In fact, It looks very promising as a back up solution. They just released PowerFolder 1.0 (for Windows & Linux). It's Java-based and installation will not finish if you do not have Java Runtime Environment 1.5 or above, so you may want to go to www.java.com and download it if you do not have it. I installed it on my 3 PCs (2 XP and 1 Win2K3) and set up some folders for syncronization. These folders have about 150 folders & 15000 files. What I see is, it detects the differences and starts uploading/downloading but in a few minutes my systems start to hang. It seems to be very resource hungry and kicks my CPU usage to 100% (I have dual P4-2.8 GHz CPU). Free version of SyncBack (v.3.2) seems quite promising actually. I installed it on only one of my PCs and I was able to specify remote directories for sync'ing. Speed was OK. Setting up sync profiles were straight forward too. I am planning to install it on the other PCs and modify sync profiles accordingly. I checked their Support site and two methods to carry profiles were discussed here. 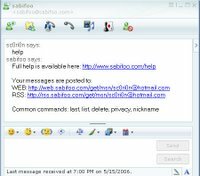 I was looking for a way to take notes and access them from anywhere and I came across this interesting tool called Sabifoo. You just add it to your IM. 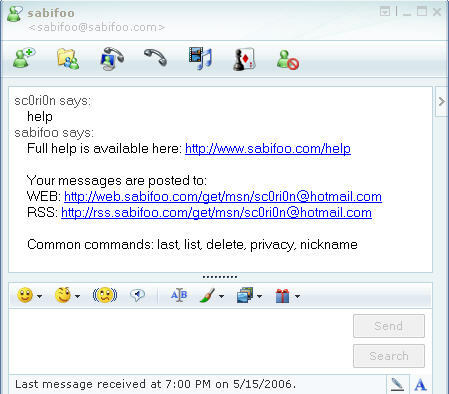 Then, whatever message you sent to it will be posted to a web site and you can retrieve it from there. Yippee! I love skype. Voice quality is very good compared to others. As explained in this FT article, now they are upping ther ante and making it free to call landlines from your PC (skypeOut) *FREE* until the end of the year! Competition is good! I've downloaded the latest Skype 2 and made calls to regular home and cell phones without any issues. 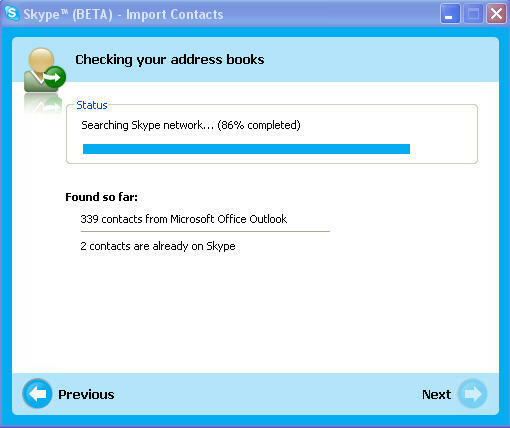 I've also tried the Skype 2.5 beta (2.5.0.72), which has additional features that makes calling even easier. On the left, you can see the "import contacts from Outlook" screen. Instead of importing them, you can also just "view" them. We all have our biases and argue with others. You sometimes see people arguing in a faul way. They use fallacies. Below is a description of fallacies from Nizkor Project Web Site. You can also find there how to recognize fallacies. A must-read! 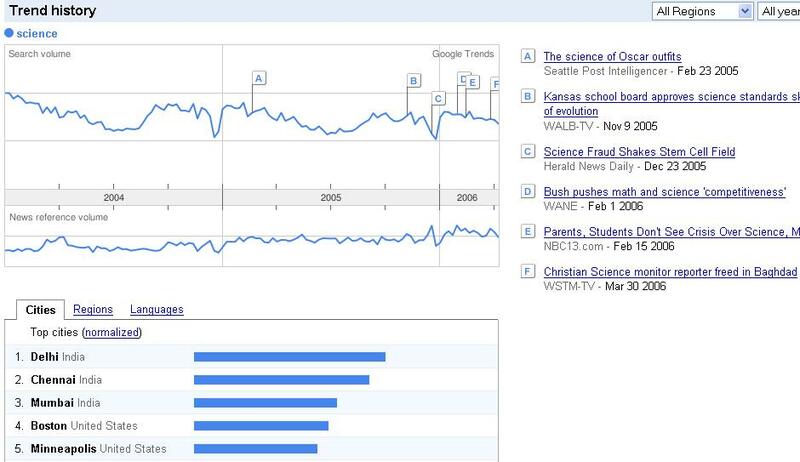 Google recently announced yet another nice search related feature called 'Google Trends'. 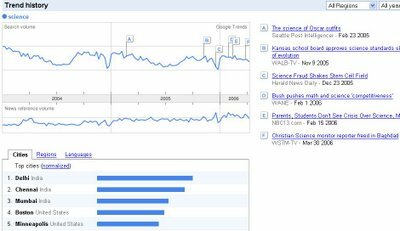 Basically, it's a web site (http://google.com/trends) where you can type keywords and see how popular those keywords has been over the time and where they are most popular. It's fun to throw out some keywords into it and see the results. Let me warn you though, if you put in more than one keyword, then results are displayed so that you will see the cities where the first keyword is most popular and popularity of the remaining keywords on these cities. So, I would suggest to use one keyword at a time. See above a screenshot for "science". Yet another sign of upcoming India? I'm back in my home country, Turkey, for a few days now and I just heard about some discussions on singing star-spangled banner in Spanish. In the early 1800's musical instruments and performances were not common in America. Music was generally imported from Europe, and popular tunes were frequently re-used as foundations for other lyrics. As an example, Maryland's state song, "Maryland, My Maryland" can be recognized as the German tune, "O Tannenbaum" (Oh Christmas Tree). Francis Scott Key used this English drinking song to set the meter of "The Star-Spangled Banner."